Live or work in Oro Valley? We offer emergency air conditioning repair services in Oro Valley, both for residential clients and businesses. We have 24/7 urgent NATE-certified AC repair technicians on stand-by. Regardless of the time heating & air conditioning issues take place, we send our certified technicians to diagnose problems and provide reasonable alternatives for repair, replacement and installation of A/C units. If you happen to be in need of an emergency AC repair, call us now at (520) 408-2665 for prompt assistance. Our technicians are usually not too far from your home. When an air conditioning system goes down (and they go down due to heat and monsoons), the cost of repair can be shocking. It can literally set you back hundreds of dollars. The first way to keep down the cost of repair is to keep your air conditioning maintained by accredited professional A/C technicians. Regular maintenance visits by NATE-certified technicians are the first measure to continue benefiting from the manufacturer’s warranty. A/C manufacturers will consider your warranty void if you don’t get your a/c system maintained correctly all year long. This is not an option: this is a contractual requirement by the manufacturers, all of them. If you are out of warranty because your system was not covered for its entire lifetime (usual 12 to 15 years), you need to consider signing up a maintenance agreement with a professionl A/C company. There are plenty of a/c companies in Tucson and Oro valley, so you have a wide choice. 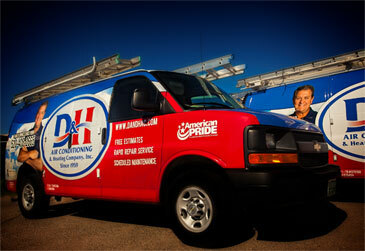 We hope that you will give D and H Air Conditioning a shot at becoming you’re a/c repair and maintenance company. We offer a great maintenance plan called “Guardian Planned Maintenance”. Under this agreement, we come twice a year to do a full inspection of your a/c system. We do a tune-up in preparation for the season to come, and we test all components of your system to make sure that everything functions correctly. The problem is often that one weak component will trigger a cascade of problems, leading to a costly system failure. The Guardian Planned Maintenance contract gets this out of the way: by testing all components and identifying risks of critical failure, then replacing the parts that have major issues, we prevent catastrophic air conditioning failures that cost a lot of money. On top of that, our clients under the Guardian Planned Maintenance agreement wil also save money on the cost of necessary repairs. We typically give discounts on these parts, when they are not covered by the manufacturer’s warranty. We maintain a large fleet of trucks on the road at all times, and in Oro Valley it is not rare to see five or six D and H Air Conditioning trucks in various neighborhoods in the same day. Is your own neighbordhood in this list? If you live in Oro Valley, use these coupons and give us a call at (520) 408-2665 to inquire about our Guardian Planned Maintenance Agreement or for any air conditioning service & repair you may need. We can usually service all Oro Valley residents within hours of your call.